Our investigator then asked Littleton if he had seen Michael throwing pebbles, would he say so? Littleton's answer: "No." Body Disposal Site: The area selected to dispose of the body is not one that would be selected by a person unfamiliar with the area. It is a considerable distance from the major attack site and subjected the killer to much greater possibility of being observed while moving the body. The killer had to know the location of the tree and the cover it provided. 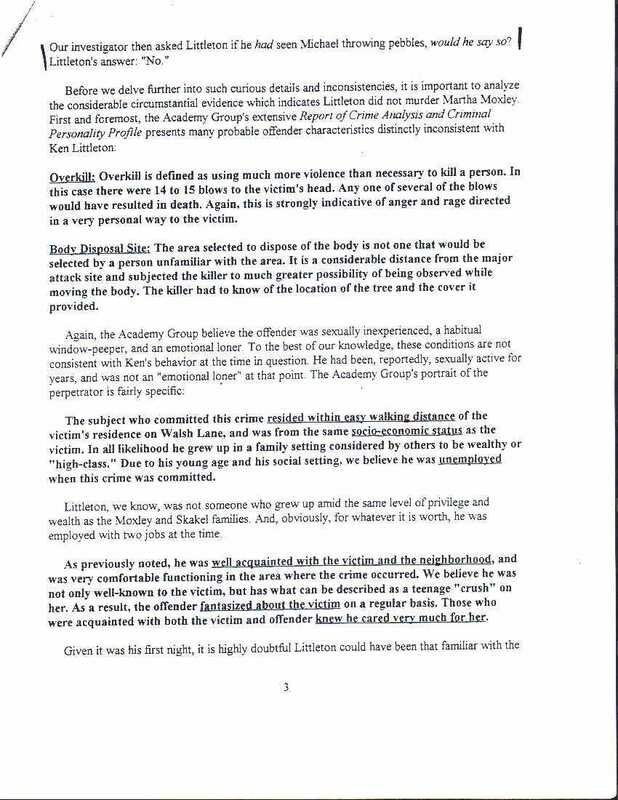 Again, the Academy Group believe the offender was sexually inexperienced, a habitual window-peeper, and an emotional loner. To the best of our knowledge, these conditions are not consistent with Ken's behavior at the time in question. He had been, reportedly, sexually active for years, and was not an emotional loner" at that point. The Academy Group's portrait of the perpetrator is fairly specific. The subject who committed this crime resided within easy walking distance of the victim's residence on Walsh Lane, and was from the same socio-economic status as the victim. In all likelihood he grew up in a family setting considered by others to be wealthy or "high-class." Due to his young age and his social setting, we believe he was unemployed when this crime was committed. Littleton, we know, was not someone who grew up amid the same level of privilege and wealth as the Moxley and Skakel families. And, obviously, for whatever it is worth, he was employed with two jobs at the time. As previously noted, he was well-acquainted with the victim and the neighborhood, and was very comfortable functioning in the area where the crime occurred. We believe he was not only well-known to the victim, but has what can be described as a teenage "crush" on her. As a result, the offender fantasized about the victim on a regular basis. Those who were acquainted with both the victim and offender knew he cared very much for her.